A group of companies led by Italian firm Impregilo has been awarded the first major contract on the Doha Metro project, a statement from the company said. The consortium will develop the underground “Red Line” of the Doha Metro at a cost of some $2 billion (QR8.4 billion). SK Engineering & Construction and Galfar Engineering & Contracting are the other two companies involved in the project, Arabian Business reports, citing Italian media. Doha’s upcoming Red Line will run 13km north from the Msheireb Downtown development toward Lusail through a total of seven stations. The Msheireb station, which broke ground last October, is expected to serve as a hub for the Red Line, as well as the metro’s Green and Gold lines. The Blue Line is the fourth line of the Doha Metro. Although an overall national rail network isn’t due to be completed until at least 2026, the Doha Metro Red Line is supposed to be operational in time for Qatar’s 2022 World Cup. “The Phase 1 of Doha Metro is scheduled to be operational in the fourth quarter of 2019,” Qatar Rail CEO Saad Ahmed al-Muhannadi told Gulf Times last October. 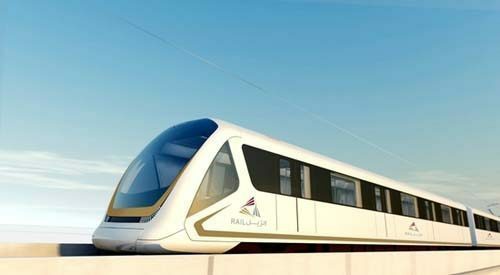 The other elements of the national rail plan are a Light Rail transit system for Lusail area, as well as long distance passenger and freight lines that are meant to connect to a GCC-wide network. A West Bay people mover had also been announced previously, but those plans have been frozen due to rising project costs. 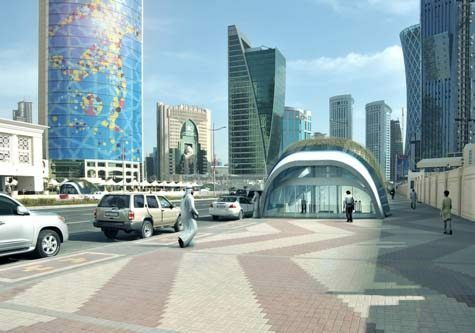 Credits: Renderings via Qatar Railways Company, video via ILoveQatar, story via Arabian Business.